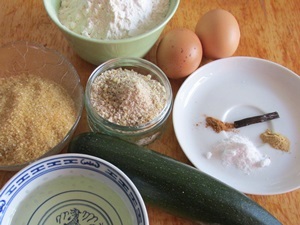 Zucchini or courgette cake might be known as wonderful moist cake. We used this recipe from our family cookbook and adapted it for delicious moist muffins with zucchini. 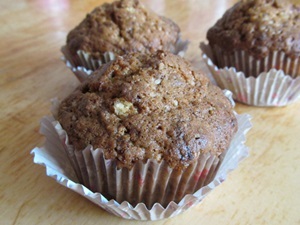 To be honest when adding vegetables to sweet muffins, they don't turn out to be a nutritious meal, yet they are healthier and less heavy and rich than typical desserts. On the other hand you need not to worry, that they taste "healthy", similar to the carrot cake, usually the veggy ingredient won't be noticed, but the green dots of the zucchini skin. And if you have strict carnivores and members of the anti-vegetable gangs in your family, you can peel the green skin of, and they will never know – unless you tell them. Preheat the oven to 180degrees Celsius, fill a muffin tray with 12 liners. 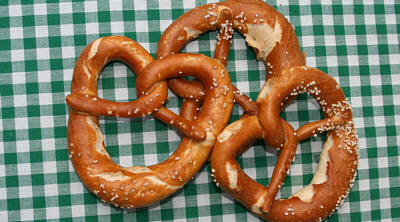 Mix flour and baking powder, add baking soda and spices. In a second bowl beat eggs until foamy, add sugar and the seeds of the vanilla pod and mix thoroughly. Add nuts and oil, and bit by bit add the flour-mix. When all is well mixed add the grated zucchinis. 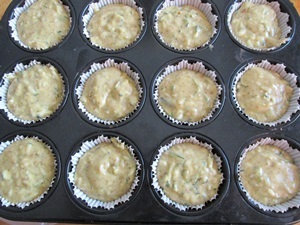 Fill the muffin liners evenly with muffin dough. 250g of zucchini, that is about a middle-sized zucchini. That is quite a lot of zucchini. This muffin recipe is perfect to use up a lot of zucchini, and that is why it is so popular in our family and widely approced. Because during every summer there comes the time vegetable gardeners harvest tons of zucchinis, and although they taste delicious being grilled zucchinis, filled zucchinis, roasted zucchinis, you still have tons of them and don't know where to put them after having made zucchini chutneys and pickled zucchinis and than comes the time where you have given all of your neighbours plenty of zucchini. As zucchini, courgette is as versatile as all squash and pumpkins, desserts are the next thing that comes to mind. We warmly recommend these muffins. This is an approved recipe and regularly asked for. In the cooler summer weeks when autumn is approaching we recommend to allow these muffins a flush of chocolate. Cover the top of the warm muffins with jam and as soon as the muffins are cold cover them with chocolate glaze. We totally love these muffins without chocolate as well throughout the whole year. 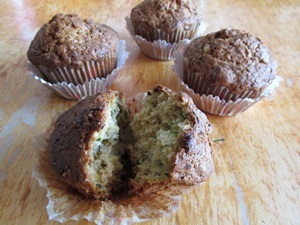 The recipe for zucchini muffins is dairy-free, it is ideal for all with lactose intolerant. If your using chocolate glaze be sure to take one which is without lactose.